You'll be £12.99 closer to your next £10.00 credit when you purchase Death in the Air. What's this? The typewritten script of a First World War pilot’s diary with a large number of photographs was submitted to the publishers William Heinemann and published by them in 1933. Heinemann stated on the book’s jacket that the diary contained no names, dates, or anything that could reveal the identity of the writer or the squadron in which he served. The publishers understood that the diarist was killed in action in 1918 and that it was in deference to the wishes of those who were close to him that his diary should be published. So remarkable were the photographs that their veracity was immediately questioned, but no proof of their authenticity or otherwise could be ascertained. It was not until 1983 that a collection of documents, photographs and artefacts was presented to the Smithsonian’s National Air and Space Museum. Some of the photographs were recognised as being those of the mystery diarist and the truth was soon revealed. The author was Wesley Archer, an American with Canadian parents who served with the RFC in the First World War, and the photographs and diary had been faked. A classic of the Great War, published in 1933 and again in 1985. When first published it was considered the ultimate record of aerial combat, with extraordinary photographs showing men and machines apparently in their last moments, as they struggled for survival in the skies over France. 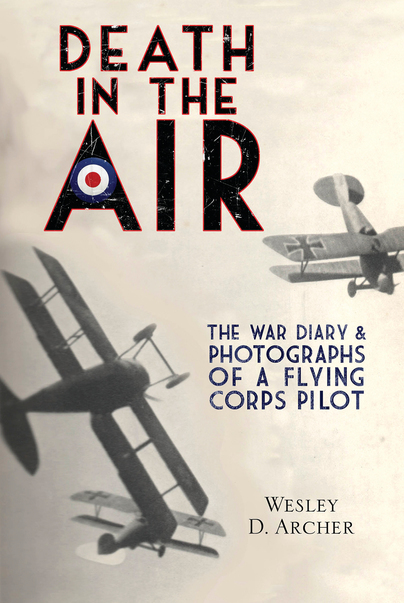 Wesley Archer was an American who served as a pilot with the RFC and who faked both the diary and the photographs. The introduction to this volume reveals the truth behind he hoax. Wesley D. Archer an American with Canadian parents who served with the RFC and the RAF. On 9 October 1918 he was shot down by ground fire while strafing German infantry in his SE5. He was hit in the chest but the bullet was deflected by his Colt pistol. He convalesced in Britain, returning to the US in 1920. He died in Havana in 1952.